Figure 7.29(a). 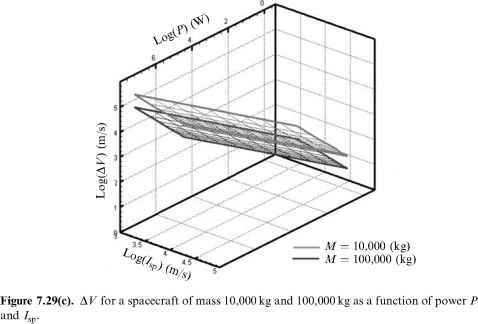 Acceleration time for a spacecraft of mass 10,000 kg and 100,000 kg as a function of power P and Isp. 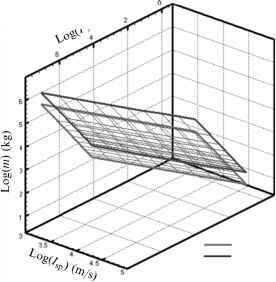 Figure 7.29(b). 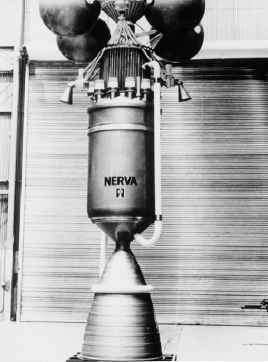 Propellant mass for a spacecraft of mass 10,000 kg and 100,000 kg as a function of power P and Isp. where M, dacc and power P have been assumed as input parameters. The solution set is plotted in Figures 7.29(a), (b), (c). Note the favorable effect of Isp on propellant mass and its opposite effect on acceleration time and A V: at fixed power, increasing thrust must come at the expense of decreasing Isp, so it takes longer and longer to reach smaller and smaller AV. In planning an interplanetary mission where at least part, dacc, of the trajectory length is flown at steady power, one may assume M and P as input. At a first glance dacc should be limited to half the distance d to the final destination (past that the spacecraft should start decelerating). However, dacc may turn out to be greater than d when the acceleration a = P/(IspM) is very small, i.e., at very low thrust and power. In this case the spacecraft must spiral (for instance, around Earth), until reaching the right escape AV. At that point the ship can start accelerating along the trans-planetary trajectory. To show problems posed by powered trajectories, consider propulsion solutions for a nominal Earth to Mars mission (minimum d about 1.5 x 108km) using a hypothetical 0.7-MW ion engine with Isp = 4,000 s, and spacecraft mass M = 100 ton. Assuming dacc = 107km, equations predict m = 5 tons, tacc = 1,157 days and AV = 2km/s. This is an impracticable solution; stretching dacc to 8 x 107km (about half the Earth-Mars distance), the new solution predicts m = 15tons, tacc = 3,450 days and AV = 6km/s, still too low. This is not only impracticable, but also costly in terms of xenon. Raising power by a factor 10 to 70 MW, the (third) solution requires m = 135 ton (violating the m ^ M assumption), but both tacc = 33 days and A V = 54km/s look good. Although calculations should be repeated, to reduce the xenon mass until satisfactory, a practicable fast mission seems within reach, but mass expended would consume a good portion of the annual worldwide production of xenon. Note M = 100 tons would be an absolute minimum for an interplanetary manned spacecraft. The preliminary conclusion is that for certain (ambitious) missions current or projected, ion engine technology is insufficient to produce a "good" trajectory, meaning reasonably fast and cheap. Only much higher Isp, of order 10 times those now available (that is, 40,000 s) can provide a truly satisfactory solution: this means much more powerful nuclear reactors. Scaling electric thrusters (in this case ion engines) from the small ones working on geostationary satellites has implications beyond simply engine sizing. However, as said, the technology developed to inject plasma beams inside fusion reactors (Tokamaks; see also Chapter 8) may supply viable solutions. To avoid quenching fusion reactions near the inner walls, plasma fed to the reactor must reach high velocity. So, the feeding device may be considered an electric ion thruster. In fact, this seems to be the case, an power levels MW, with thrust of the order 20 N or more, are projected in the near future [Fearn, 2005, 2008]. Note that the simplified analytical solution just obtained depends, among other things, on having assumed the propellant mass is negligible with respect to the total mass. In general, Tsiolkovski's relationship should be used, but that will complicate matters considerably, in that simple analytical solutions may not be obtained and numerical integration may become necessary. 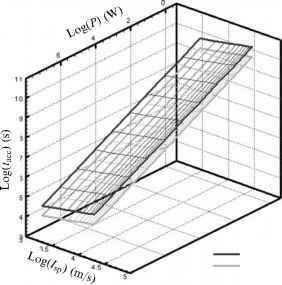 Workable and better solutions may also be sought by dropping the assumption of continuous thrust, and varying the duration of thrust-on periods in transplanetary and orbit-capturing trajectory segments.